Social Media Marketing Company in Michigan | Blogging Services & More! Let’s Create Your Blog, Generate Buzz, and Increase Your Social Exposure Online! Social Media marketing is included in every campaign! 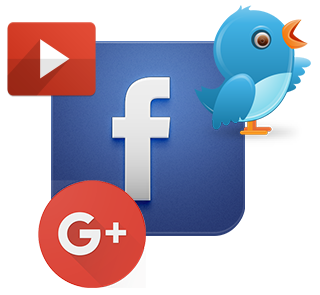 We create social accounts and syndicate targeted content to your audience. We will create powerful social media advertising that will help drive more traffic and establish your presence online. Our team of content marketing specialists and social media marketing experts are here to help you grow online! We can craft an effective social media network to drive more conversations. Our efforts are geared to help grow your business and ultimately increase your social reach online. We offer a personalized approach to blogging services and will be happy to meet with you. Social media can be an incredibly valuable tool to help extend your “social reach” in the local market place. We offer a managed solution for our clients as we create and maintain a blog keeping content “fresh” for syndication across social networks. Our content marketing and blogging services utilize social media strategically, as we create an effective marketing vehicle to grow your online brand identity. Let’s create your Facebook page, Twitter profile, Google+ Profile, and YouTube Channel, and More! The blog content created by our blogging specialists, will be syndicated to your social accounts, including video! We will also help integrate social media elements into your corporate website so visitors can share content and help spread the word. The more content posted on your social media network, the more likelihood that it will get shared by the site visitors and social media users. Content Management (blogging) is a method to post information regarding your business. 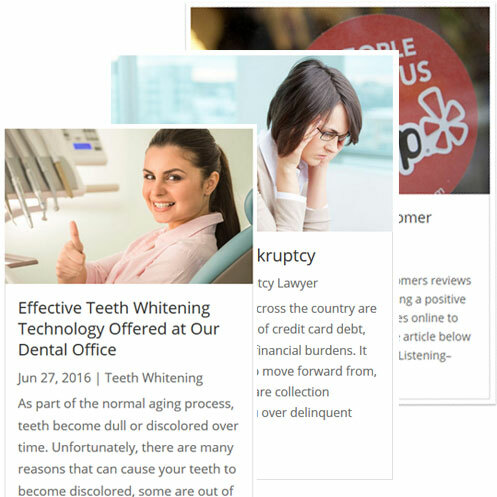 Your blog posts can include current events, new services, educational topics, or just blog for fun! Our blogging services are a great way promote your website and attract inbound interest, drive traffic, and ultimately generate new business. An effective content marketing strategy will help your business in the long run, and is most definitely worth your time and effort. We work with local businesses to increase their brand identity online, and are more than happy to discuss your project! There are many benefits to integrating a company blog with your website and social media accounts. Search engines love new and “fresh” content. Creating blog posts and articles on a regular basis will assist in optimizing your site and attract the search engine “bots.” Blog posts gives signals to Google, Bing, and other search engines the opportunity to index your pages. When this happens, your keywords and other important information regarding your business gets syndicated online. We offer free consultations, so please contact our website agency at any time. Quality blog posting for your website and social media accounts, offers your current and perspective customers additional information that they would not normally see through “traditional advertising.” This added content marketing effort helps to bolster your authority online. When working with our clients, it is our goal to build your local business credibility, offer informative and engaging content and blogging services – all geared towards boosting your search engine rankings! We will create, maintain, and syndicate your blog to your social media and other important social networking sites. This will help ensure your potential audience will find you online! Another important consideration for choosing our content marketing agency, is that we will create the opportunity for your audience to share your blog posts with others. Links, tweets, likes etc., all help expand your marketing reach and lends credibility to your business. A content management & blogging program enables your readers to recognize that you care about your audience. This will build trust and ensure the conversation continues well into the future. You can build trust within your profession by offering valuable information via your blog posts. Over time, you can become a great resource for helpful information. Visit Our Blog To Learn More About Content Marketing!